The origin of Peter Pan (Levi Miller) and how he came to Neverland. Set during WWII, it follows the story of Peter, who has an absentee mother and lives in an orphanage. 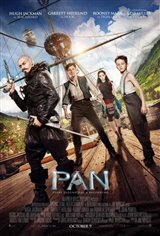 One night, all the boys in the home are kidnapped by pirates in a flying ship and brought to Neverland to work as slaves. Because Peter wears the necklace of Pan, which denotes the bravest warrior in Tiger Lily's (Rooney Mara) tribe, it's deemed he's destined to save the land from the pirate Blackbeard (Hugh Jackman). Along the way Peter forms a bond with James Hook (Garrett Hedlund), who helps him on his mission.